Deepawali or Diwali is certainly the biggest and the brightest of all Hindu festivals. It's the festival of lights (deep = light and avali = a row i.e., a row of lights) which literally illumines the country with its brilliance, and dazzles all with its joy. The festival of Diwali is separated by different tradition, but what remains true and constant is the celebration of life, its enjoyment and goodness. 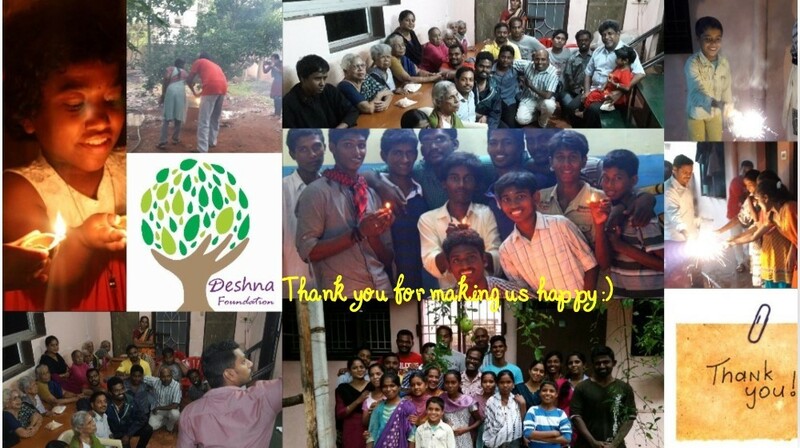 This year, we at Deshna Foundation decided to spread the happiness and enjoyment with the kids and elderly people. Our team of volunteers despite of rains and their busy work schedule made this years deepawali event a great success..
More than 150 beneficiaries which include differently abled children and elderly people have been benefited. We thank our donors for supporting us to share happiness with them. A delicious meal, fruits,sweets and snacks were distributed for the following organizations..
Jwala home for the special children. A Big thank you for all the donors and volunteers for making this event a great success!! And a Happy Diwali ! !